MSHA Part 46. Refresher Training is open to OCAPA members and non-members in the construction materials industry. Industry partners, guests, and potential members are encouraged to attend. These training take place twice a year. Currently there are no classes schedule, please check back for updates. Click link above for a class description. If you have 10 people or more, OCAPA can arrange a training date and location for your group. Call us at 503-588-2430. Another MSHA Part 46 Training will be offered March 12, 2019 in conjunction with Spring Thaw at Eagle Crest Resort in Redmond. OCAPA member employees receive discount pricing on MSHA Training classes. 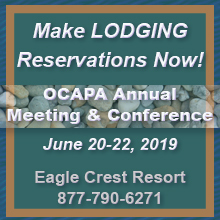 If you are not sure if your company is an OCAPA member check here. Classes are from 8 am - 5 pm; lunch is included. Registration closes at 10:00 pm 3 days prior to each class. If you are interested in scheduling a training at your location, click here.